Easy check in; great location: very clean and friendly staff. Would definitely stay here again. The staff at Chadwick's, which is connected, was outstanding. Where to find Grants Pass hotels near an airport? Where can I find hotels in Grants Pass that are near tourist attractions? 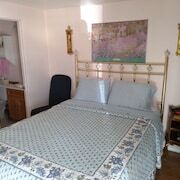 On the lookout for a warm welcome and a comfy room in Grants Pass? Expedia's accommodation network has around 14 places to stay within easy driving distance from the town center. 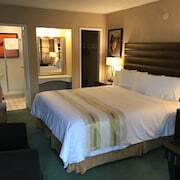 Travelers searching for Expedia-listed hotels and accommodations conveniently located to the heart of Grants Pass, can choose from the The Lodge at Riverside and Knight's Inn Motel. Budget travelers can breathe easy. The Grants Pass area offers a fine selection of lower-priced hotels and accommodations. The Quality Inn is 3 kilometres (2 miles) from the main part of Grants Pass, while the Best Western Grants Pass Inn is 3 kilometres (2 miles) away. 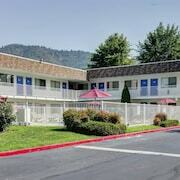 Different affordable accommodation options include the Shilo Inn - Grants Pass and the Super 8 Motel Grants Pass Or. The Weasku Inn is located 8 kilometres (5 miles) from the center of Grants Pass. 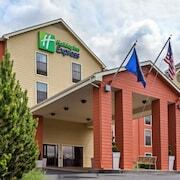 Or, alternatively, the Holiday Inn Express Grants Pass is situated 2 kilometres (2 miles) away. Some other alternatives in this area include the La Quinta Inn & Suites Grants Pass and the Best Western Inn At The Rogue. The nearest places to spend the night in Medford are Ashland and Historic Jacksonville. Ashland is 55 kilometres (36 miles) to the southeast of Grants Pass, while Historic Jacksonville is 35 kilometres (20 miles) to the southeast. Ashland hotels and apartments are the Plaza Inn & Suites at Ashland Creek and Country Willows Inn. The TouVelle House Bed & Breakfast and Jacksonville's Magnolia Inn are amongst the hotels and apartments in Historic Jacksonville. Before your Grants Pass trip comes to an end, why not spend an hour or two cheering along with local sports enthusiasts at a local match. You'll find Siskiyou County Fairgrounds 100 kilometres (62 miles) to the southeast of Grants Pass. Book a hotel right near the action at the Holiday Inn Express Yreka-Shasta Area or the Best Western Miner's Inn. 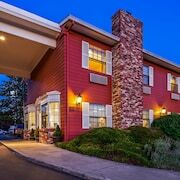 For travelers planning on arriving via Rogue Valley International Airport, you may find it convenient to book a room at Courtyard Medford Airport, or Hampton Inn Medford, both of which are a short distance away. What are the most popular Grants Pass hotels? Are there hotels in other cities near Grants Pass? 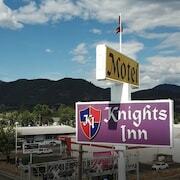 What other types of accommodations are available in Grants Pass? Explore Grants Pass with Expedia.ca’s Travel Guides to find the best flights, cars, holiday packages and more!